Protesters at a "Fridays with Frelinghuysen" demonstration organized by the group NJ-11th for Change. NEWARK, N.J. — A New Jersey woman who joined a group critical of a Republican congressman and President Donald Trump’s policies says she quit her job after the congressman referred to her in a fundraising letter to her employer. 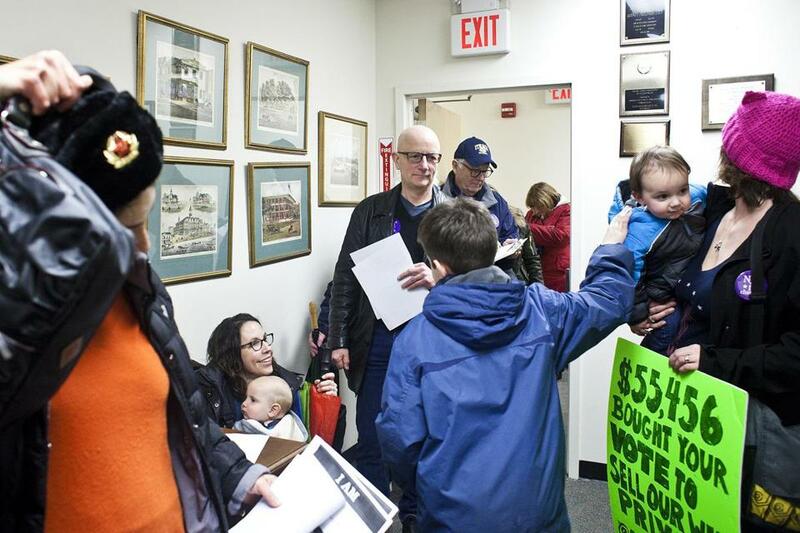 Saily Avelenda, who worked as an attorney for Lakeland Bank, said Monday that a handwritten note at the bottom of a March letter from Rep. Rodney Frelinghuysen to a bank board member said a ‘‘ringleader’’ of the protest group worked there. Avelenda said she was disbelieving at first when she discovered the letter’s existence, but then began to feel she had been targeted. She said she didn’t publicly discuss where she worked during her activities with the group. ‘‘I had been involved in sort of the back side of what we were doing,’’ she told The Associated Press. ‘‘A lot of people were on the front lines, but I wasn’t part of that. For him to get my name and find my employer, that took some effort. Avelenda is part of ‘‘NJ 11th For Change,’’ which refers to Frelinghuysen’s district number. The group has criticized Frelinghuysen for not holding in-person town halls to discuss issues including the GOP health care plan. She said she wasn’t asked to resign, but that being confronted about her outside activities made her uncomfortable and was a factor in her resignation. Frelinghuysen’s office didn’t comment Monday. A longtime member of Congress, Frelinghuysen chairs the powerful House Appropriations Committee. Lakeland Bank didn’t return a message seeking comment Monday. Lakeland has about 50 branches in New Jersey and one in New York state. WNYC-FM in New York first reported the letter Monday.